Wanting to make things fly has been, and remains, a child's dream. As we grow, so does our fascination with flight. In making model airplanes and paper airplanes we are constantly fueling our thirst for it. The one magical object that I recall from my childhood, but feels like it’s from the beginning of time, is the small balsa-wood airplane models made by Guillow. Their design seemed so simple, and yet with just the twist of a small rubber band could be sent to soar in an instant. 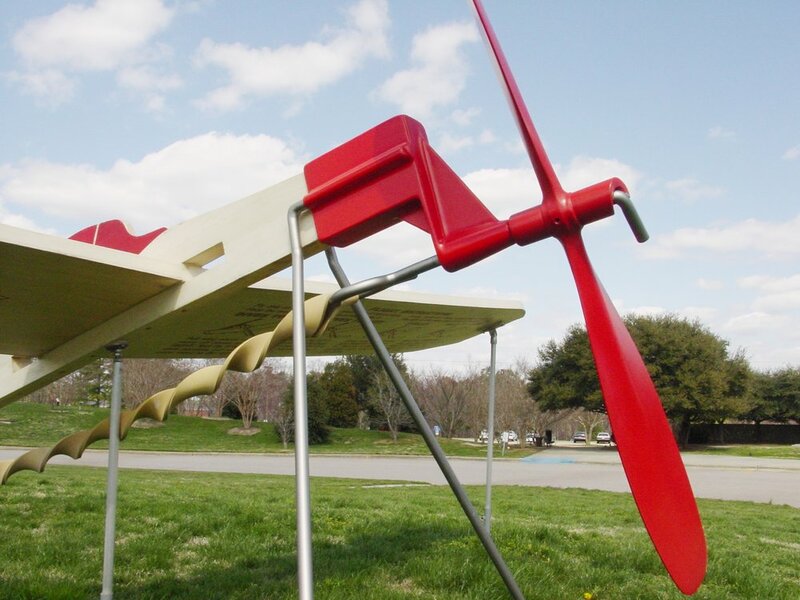 The idea of making a larger-than-life sculpture of this iconic toy was originally conceived while I was installing artwork next to an aviation school. I was drawn to the notion of how an artist that was naive to the engineering of flying machines could build something that evoked the feeling of flight in the physical sense. Working within my scope of reference and the intent to make a work of public art, the balsa wood airplane seemed the natural choice. Since I wasn’t competing with real airplanes but just dreaming, I recalled what was important to me as a child. This childhood memory of flight successfully resonated with the public, and after exhibitions at MetroTech Center in Brooklyn, and City Hall Park in Manhattan, I was honored to be asked to instal the piece to celebrate The Centennial of Flight at Rockefeller Center, 1903-2003. Set amongst full-scale replicas of actual machines of flight, including the F-16 Fighting Falcon, Lunar Module, Space Shuttle cockpit, and Mercury Redstone Rocket, Balsa Wood Airplane: The Land That Time Forgot was the only non-scientific artwork in the exhibition. 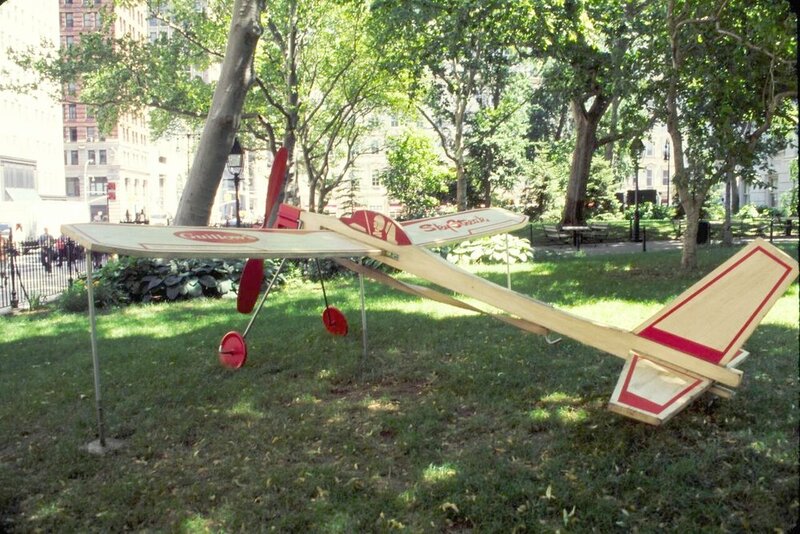 Art Domantay's Balsa Wood Airplane: The Land That Time Forgot, [is specific] in its reference to travel, although the trip it proposes is not so much the one of physical flight that its form so explicitly suggests, but rather one through time, back to childhood. Domantay's wide-ranging conceptual practice has frequently involved recreations of familiar objects that are made unfamiliar by often-humorous warping of their context or scale. For [this] piece, Domantay has done both, producing a meticulous replica of a balsa wood airplane, enlarged more than 100-fold, so that the familiar child's do-it-yourself flying toy is now some 16 feet long. Obsessively faithful in its rendering—from the torqued "rubber band" strung between the fuselage and the propeller to the "pre-flight" operating instructions stenciled on the bottom of the wings—Domantay's "Sky Streak" sits on its own gravel landing strip, the surface of which he has subtly excavated to suggest a recently executed three-point landing, as though it had just sailed into Brooklyn over the tops of the MetroTech towers. The peculiar magic of Domantay's gesture here lies in the way that he has identified an icon of the past that looms large in the imagination, and has given it that same grand scale in reality—a trope that at once evokes the disproportionate affections of the kids-eye view and the exaggerating tendencies of adult nostalgia. Our first loves the work seems to say, may be fleeting—temporary—yet they remain with us, available to be called forth with the right kind of prompting from their residence deep inside our memories.